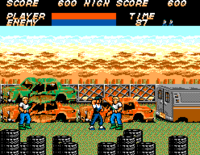 Vigilante is an arcade beat-'em-up game released by Irem in 1988. The following year it was ported and published by Sega for the Sega Master System. 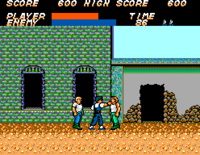 Upon release, Vigilante was considered to be a sequel to the 1984 arcade game, Kung-Fu Master (known as Spartan X in Japan and in its NES incarnation, simply Kung-Fu). 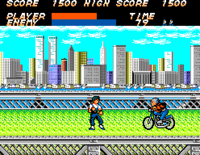 Vigilante is a side-scrolling beat-'em-up game where an unnamed player protagonist (the "vigilante") attempts to rescue his girlfriend, Madonna (Maria in this Master System version) from a group known as the Skinheads (Rogues). Although this version of the game was never released in Japan, the Master System Vigilante is compatible with the FM Sound Unit which was only supported by Japanese (and Korean) consoles. 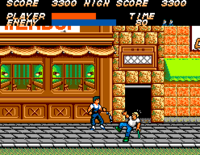 Gameplay is similar to Kung-Fu Master, with the exception that it is now possible to pick up nunchaku to deal extra damage. 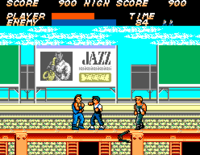 A subsequent hit will cause the player to drop the nunchaku. punches (or attacks with the nunchaku) and kicks, + jumps. There are five stages set across the city of New York. 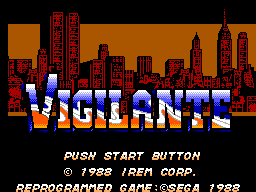 NEC Retro has more information related to Vigilante.